Get the party started with a pitcher of punch. Our CRYSTAL LIGHT Citrus Punch features citrus and soda for a quick sparkling beverage. Add water to drink mix in 2-L glass or plastic pitcher; stir until mix is dissolved. Squeeze juice from 1 lime. Add to prepared drink along with the club soda; stir. Slice remaining lime. Add to punch along with the orange slices. 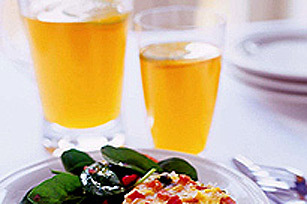 When serving adults, stir 1 cup dry white wine into prepared punch along with the club soda and lime juice, if desired.